What makes Out of Sight Litter Box® the best cat litter box money can buy? Well, we’re glad you asked. Below we list just a few of the reasons you can count on our Out of Sight Litter Box® to be the very best litter box you will ever purchase. In fact, we believe it will be the last litter box you will buy. The bitter taste of poor quality lingers long after the sweetness of low price is forgotten. 1.) Quality made in America manufacturing. It’s said you get what you pay for, and I’ll pay extra for high quality, and I do with my current and final manufacturer; Achievia Furniture, Inc., a subsidiary of Funder America, Inc. They take pride, as much as I have, in making sure each panel is right and double check each panel as they are put into the shipping box. The cabinet panels are 5/8 inch thick which allows the use of hidden pins and cams for assembly. The high grade California approved plastic coat melamine surface allows easy cleaning and repels litter box “misses” for hours. Funder America, Inc. manufacturers the majority of melamine panel sheets for the USA, like 40 semi truck loads a day. All of my panel edges are “edge banded” to help seal them from moisture absorption. Even the “blind” edges of my panels that you don’t see after assembly are edge banded, which costs more to have done, but very worth it. My back panel is made from the same panels as all the others, and makes the back look as good as the front. This allows the cabinet to be free standing, it can be placed anywhere in a room. 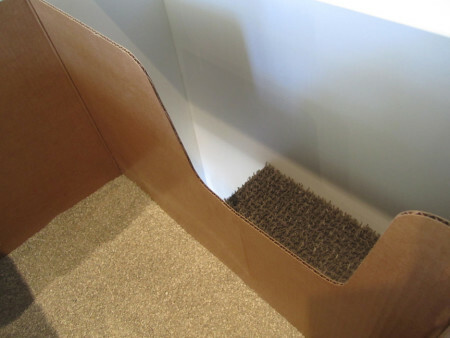 My front, and back panels have been designed to allow air flow and light into the cat litter box cabinet area. 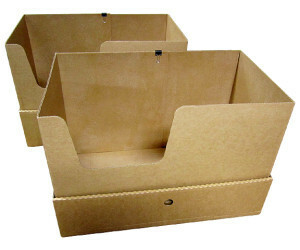 The Out of Sight Litter Box® is a high-quality, low-tech, high-design, MADE IN AMERICA product. It has no electronic or mechanical parts to set or to break. 2.) 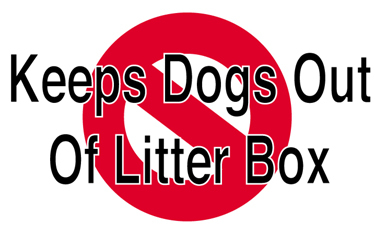 The Out of Sight Litter Box® stops litter tracking. 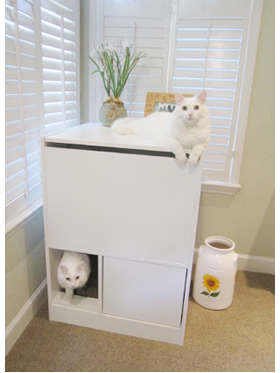 As you have been surfing the web and found – many litter box cabinets that just cover the litter box – the huge difference and one reason that makes Out of Sight Litter Box® the best cat litter box is that the litter box is located up on a patented second shelf. Doing this makes your daily scooping/cleaning life easier by not having to bend over or kneel to the floor to reach the litter box, all better for you. Next, when your cat hops out of the litter box and then jumps down upon exit, your cats paws open naturally which allows litter to fall out and be trapped in TraxTurf™ that would otherwise be tracked throughout your home, again, all better for you. And yet another reason to have the litter box raised off the floor… it now will only take you one minute in the morning and one minute in the evening to walk up, open the top lid, and scoop to clean, all the better for you too. 3.) Two High-Sider™ litter boxes are included. The litter box is located within the Out of Sight Litter Box®, so, you no longer have to look at that mess. 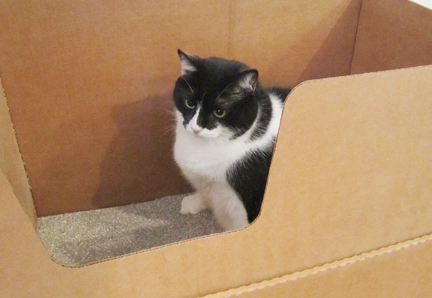 Using the included High-Sider™ wax saturated cardboard litter boxes (you get two included with cabinet purchase) the high 15 inch tall sides contain all that litter within the box when your cat starts digging to China or starts flinging litter to cover up. You will no longer be wasting your valuable time cleaning up kitty litter mess from around your cats litter box. Also the High-Sider™ litter box keeps kitty from “missing” over the sides. 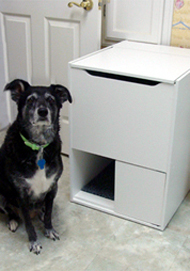 My High-Sider™ litter box assembles easily, and is a three layer overlapping system. I like it better than any of the plastic ones I’ve ever used! The bottom is flat, and the walls 90 degrees vertical. Replacements are sold in pairs on my Accessories Page. I have 4 cats that use one litter box, and it has been great shape after six months use, if you only have one cat… that would equate to lasting more than one year. It works! No smells. No leaks. No problems. The High-Sider™ Litter Box is great for multi-cat households. Also great to use as stand alone litter box (with no cabinet) while traveling. 4.) The Out of Sight Litter Box® keeps dogs out! The easiest way to keep your dog from eating cat poop is to remove the opportunity. Dog proof the litter box… Out of Sight, is out of mind. Because cats have more agility and flexibility than dogs, my patented cabinet design keeps the cat litter box out of reach of most mischievous dogs as well as inquisitive children. With the litter box located on the second shelf, most dogs can not bend to get up there. 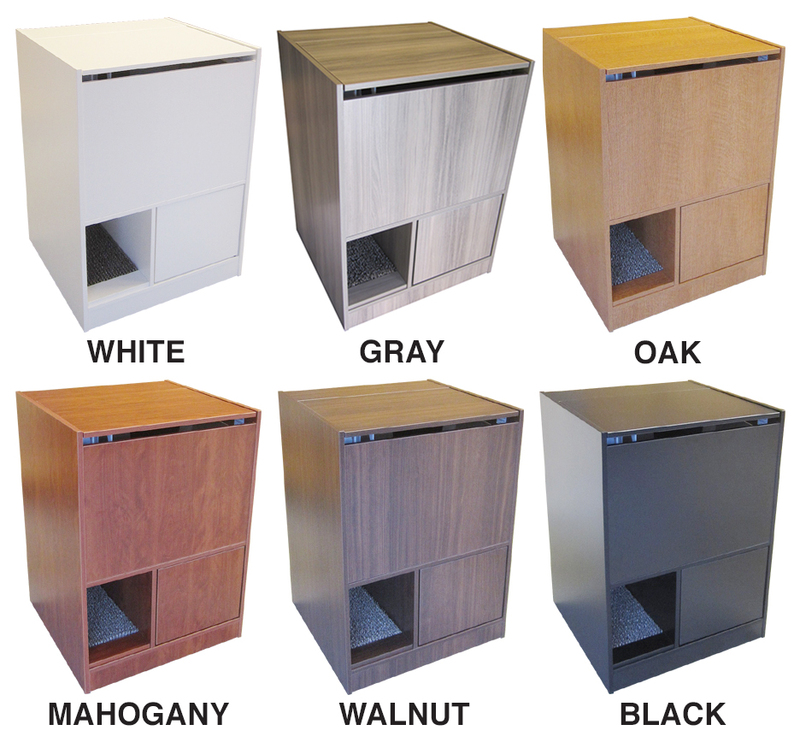 Plus, you get all the other benefits of the Out of Sight Litter Box® cabinet design. Read more on my Blog Page. 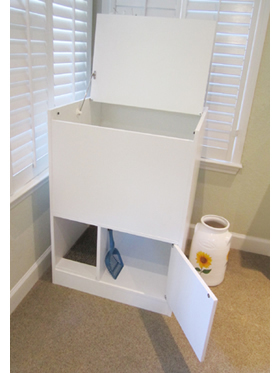 The Out of Sight Litter Box® cabinet has been designed to keep your cats litter mess, Out of Sight! My, and I say my, because I am the Inventor and the one who will be taking care of your order. I could use the words “us” or “we” or “our” to describe “the company” in all the web site text, but the truth is, I have worked too long and too hard, for you to think you are just dealing with another big uncaring company – you are dealing with me, Paul I. Pettys, “Cat-man-doo-doo”. Yes, Out of Sight Litter Box, Inc., is incorporated and so is a Corporation, but it is me who is responsible for, and proud of, the quality control of this product. You are the link to my next sale. And I want you, you alone to be happy with my Out of Sight Litter Box®, and the service you get. Solution to all your Litter Box Problems! The Out of Sight Litter Box® is easy for your cat(s) to use. Your cat enters the cabinet from floor level, through the large 9 x 12 inch opening. Next, your cat walks in and hops up 12 inches to the shelf level where the litter pan is located. The Out of Sight Litter Box® keeps the kitty litter box out of reach of mischievous dogs and inquisitive children. 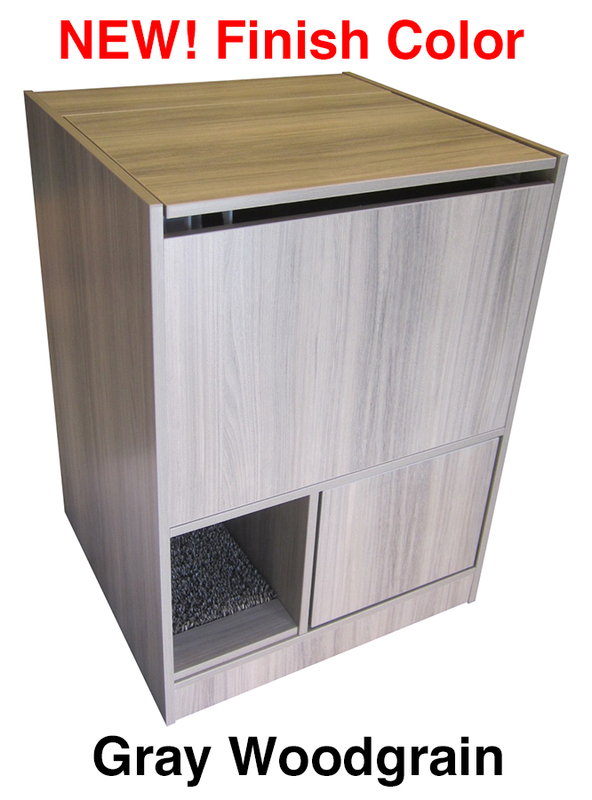 The Out of Sight Litter Box® also has a storage area with room enough to store (hideaway) your litter scooper and bag of litter all within this piece of furniture. With my Out of Sight Litter Box® it is so easy to walk up, open the top lid, scoop and walk away. One minute in the morning, one minute at night. Designed by a multi-cat owner who understands. As long as you have a cat, you will have to daily clean the kitty litter box in some way. Why not save time and make it easier on yourself. The Out of Sight Litter Box® has been designed to make daily cleaning easy on you with its easy lift top lid. The Out of Sight Litter Box® has been designed to help keep your home clean by stopping cat litter tracking with TraxTurf™. Please read the Included Page to learn more about the high quality differences the Out of Sight Litter Box® offers. Then place your order in confidence knowing you have purchased the best cat litter box cabinet MADE IN AMERICA, the Out of Sight Litter Box®.